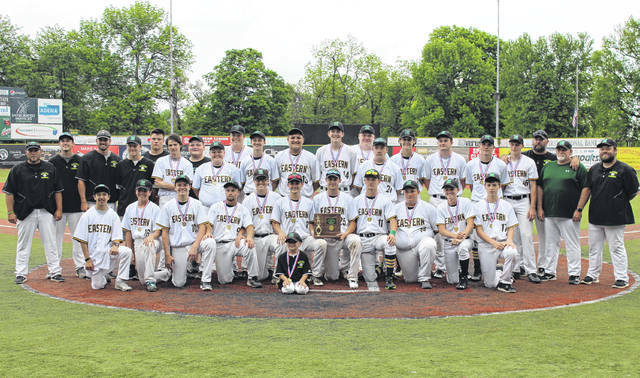 Members of the district champion Eastern baseball team pose for a photo following a 13-2 victory over Clay, in Wednesday’s Division IV district final at VA Memorial Stadium in Chillicothe, Ohio. Eastern senior Ethen Richmond pitches during the first inning of the Eagles’ 11-run win on Wednesday in Chillicothe, Ohio. CHILLICOTHE, Ohio — No. 11 by 11 runs. 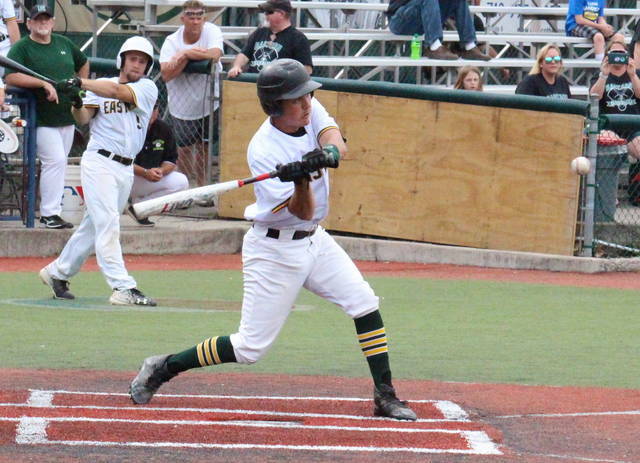 The Eastern baseball team earned its 11th district title in program history on Wednesday at VA Memorial Stadium, as the top-seeded Eagles defeated second-seeded Portsmouth Clay by a 13-2 tally in five innings. 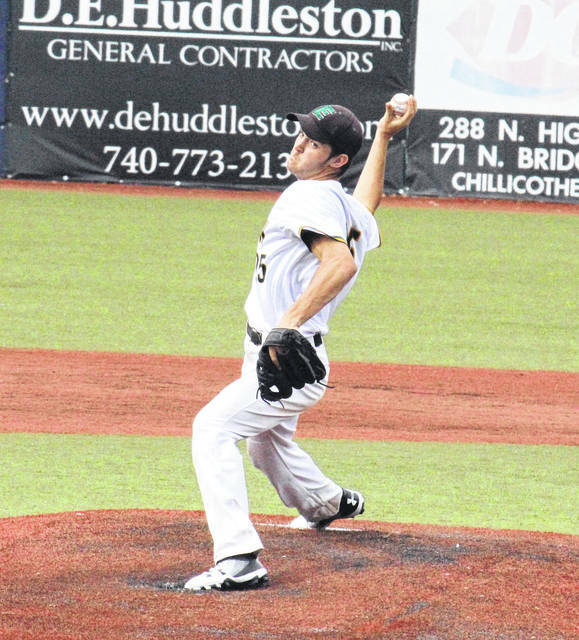 The Panthers (19-7) — who were retired in order in the first three innings — hadn’t given up a run in their first two postseason games, but that 14-inning shut out streak ended in the opening frame. The Eagles (26-2) — winners of 13 games in a row, including a 4-0 triumph over Fairfield in the Division IV district semifinal — began the bottom of the first with three straight singles, with Austin Coleman driving home Christian Mattox on the third. After back-to-back flyouts, Nate Durst singled home Coleman and Matthew Blanchard, giving the Eagles a 3-0 lead after an inning of play. EHS was sent down in order in the second stanza, but got back to business in the bottom of the third. Kaleb Hill singled home Coleman, with Richmond scoring on an error in the same play, increasing Eastern’s lead to 5-0. Still with no outs, Hill moved to third on a wild pitch and then scored on a single by Durst. With two outs in the bottom of the third, Owen Arix singled home Durst to make the Eagle lead 7-0. Clay’s first baserunner of the game came on a two-out walk in the top of the fourth, but a strikeout ended the frame. With no outs in the home half of the fourth, Richmond doubled home Blanchard and Coleman, and then scored on a single by Hill, increasing the EHS lead to 10-0. The Eagles plated three more runs with two outs, as Mattox tripled home Hill, Durst and Isaiah Fish. Dakota Dodds recorded Clay’s first hit in the top of the fifth, and then McGwire Garrison hit a two-run double, but the Panthers couldn’t avoid the mercy rule and fell by a 13-2 tally. Following the game, Eastern head coach Brian Bowen noted the Eagles’ hard work and positive attitudes as keys to how well they played. Richmond was the winning pitcher of record in 4⅓ innings for the Eagles, striking out seven batters and allowing two earned runs on two hits and three walks. Coleman recorded the final two outs for the victors, getting groundouts from both batters he faced. Reece Whitley suffered the setback in two innings on the hill for Clay, allowing five runs, four earned, on five hits and two walks. Leading the Eagles at the plate, Durst was 3-for-3 with three runs batted in and two runs scored, while Coleman was 2-for-2 with a double, three runs scored and one RBI. Hill went 2-for-3 with two runs and two RBIs in the win, Mattox went 2-for-4 with a triple, a run and three RBIs, while Blanchard went 2-for-4 with a pair of runs. Richmond helped his own cause by doubling once, scoring twice and driving in two runs, while Arix singled once and picked up an RBI. Josh Brewer contributed a single to the winning cause, while Fish chipped in with a run. Garrison’s double and Dodds’ single were Clay’s only hits, with Whitley and Dodds scoring the Panthers’ only runs. Clay — making its first appearence in the round of 32 since 2003 — committed the game’s only error, which led to a run in the third inning. 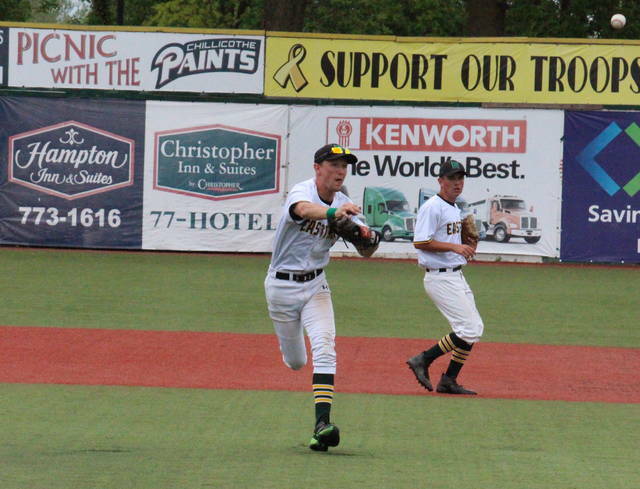 The Eagles had 14 hits but only stranded four runners on base, while CHS left a trio on base. Eastern felt right at home at VA Memorial Stadium, as Wednesday was the fifth time the Eagles have played there this season. In the Eagles’ four previous games on the artificial turf, they were 3-1. This is the second straight season that Eastern has eliminated Clay from postseason play, as the Eagles defeated the Panthers’ 2-1 in the 2017 district semifinal. In addition to this year, the EHS has also won district titles in 1971, 1972, 1981, 1986, 2002, 2005, 2007, 2008, 2011, and 2016. “It’s great validation for the kids, all the hard work and tremendous effort that they’ve put into everything since February,” Bowen said. “It’s nice for them to earn a title, being champion is something to be proud of. In Bowen’s 18-year tenure, the Eagles are 18-8 in district tournament games, with seven district championships. The Eagles will begin regional play on May 24 at Beavers Field in Lancaster, where first pitch scheduled for 2 p.m. Eastern will face the winner of Thursday’s Centerburg vs. Fisher Catholic district final. 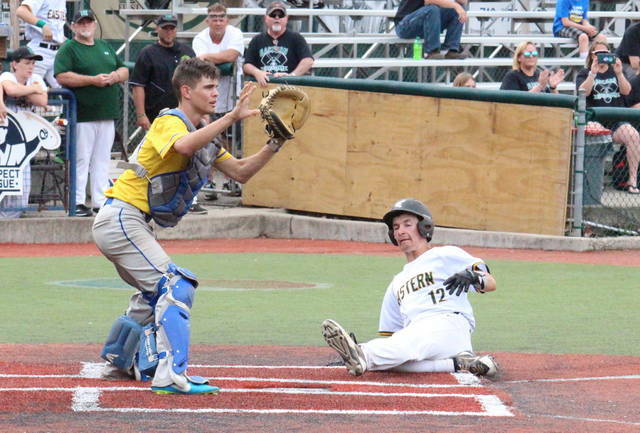 With Waterford’s five-inning loss to Whiteoak on Wednesday, Eastern is now the final Tri-Valley Conference Hocking Division team alive in the postseason.